Black History Feature of the Day: Did You Know That Dwight Eisenhower and Some Other Famous People Were Black? This essay started innocently enough. 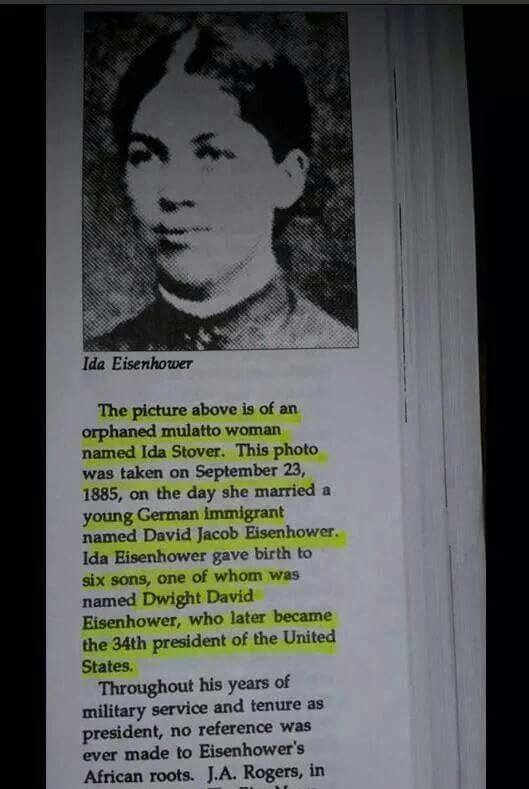 I read and shared a Facebook post declaring that President Dwight D. Eisenhower’s mother was mulatto. Which, in our racially driven American society (the “one drop” theory) would make Eisenhower Black as well. That the idea raises such hackles in people is a sure sign that it means something to people, whether positively or negatively. In my mind, it is a huge part of the Conversation on Race that we need to have. I’ll address this a bit later. But let me start with this little theory: Maybe Barack Obama isn’t the first Black President of the United States! There is speculation that he is “merely” the sixth. The other five being: Thomas Jefferson, Abraham Lincoln, Andrew Jackson, Warren G. Harding, and Calvin Coolidge! This list does not even include Bill Clinton who, by virtue of his “cool” saxophone playing on late night TV when he first ran for president (and other characteristics), was dubbed by some (and, certainly, sarcastically) the first Black president. It is not my intention to delve into all of these speculations, even though whole books have been written about them. I invite you to do your own research and draw your own conclusions. However, the Jefferson theory caught me by surprise; I was aware of his Black mistress (Sally Hemmings) and children, but I’d never heard of any of his ancestors being Black. Jackson, Harding, and Coolidge also threw me for a loop. I have seen and heard plenty of speculations about Abraham Lincoln, though, including the supposed “whitening” of his profile on the penny versus his appearance in some photographs. I do want to talk a little about the Eisenhowers, before branching out to a couple of stars of stage and screen (one of whom is definitely Black) who chose to “pass as White” in order to attain their star status. The Eisenhowers: “Evidence” of Blackness? In her wedding photo, Mrs. Ida Eisenhower certainly looks Black or mixed race. Also, to my eye, two of D.D.E.’s brothers “look” mixed in some photographs, particularly in younger photos I viewed: Earl D. (an electrical engineer and, briefly, legislator, died in 1968); and Milton S. Eisenhower, known here in Baltimore, Maryland as a former President of Johns Hopkins University; he died in 1985). Even D.D.E. looks Black in a photo of him at West Point. So what makes me identify them as Black? For one thing, there’s something about their complexion that looks darker, even in black-and-white photos. And there are facial features: the broad noses, the hair texture of Earl and Milton, and even the thickness of their lips in younger photos. One thing is for certain: There is no way that any of these illustrious people could have attained their positions, given the times they lived in, if their “Blackness” were known. They would have had to pass as white. The Actor Joseph Cotten was Black! How do I “know”? Because my father always told me so. My dad had served in the military with a cousin of this actor, who swore it was true. And whenever I saw Joseph Cotten in the movies, there was something about him—again, a slightly darker complexion than most White people have; again, the broad nose and fuller lips; and that curly blonde hair, almost nappy at the nape. Also, there was something about his demeanor that seemed to transcend the roles he played, suggesting that he didn’t “belong” or that he was hiding some dark secret. Of course, in the official biographies of Cotten, there is no mention of this. In fact, he came from a family of privilege, from Virginia, a major crossroad of the slave trade. But even in his childhood photos, there’s something “different” about him. In her 2002 autobiography, Just Lucky, I Guess, Ms. Channing reveals what some in the Black community (myself included) long suspected: her father, though a prominent journalist, became successful by passing as white, just as Ms. Channing herself did. Her father was the son of a German-American father and an African-American mother. Channing says that when she left home for college, her mother told her the truth so she wouldn’t be surprised if she had a black baby. I always suspected it because of her luscious, large red lips, her huge eyes, her raspy voice, and her propensity for blonde wigs. In fact, she always reminded me of one of my great-aunts, who was similarly light-complected and had beautiful wavy hair that she also hid under blonde wigs. In my research today, I came across a very interesting article on why fair-skinned Black people once chose to “pass” (http://old.post-gazette.com/lifestyle/20031026stain1026fnp2.asp). It was a necessity in the not-so-distant past. In the pre-integration eras, companies actually used the “paper bag test” to determine whether a Black person was “worthy” to be hired, especially if that person was going to be in the public eye (think receptionists, or telephone operators, for example). If you were lighter than a brown paper bag, you had a better chance of being hired. Unfortunately, this practice also extended into the Black community, with certain colleges, social organizations, and other types of organizations using this test to accept or exclude members. Recently, there was a commercial for Android with the message that we should celebrate our differences. I heartily agree. We should celebrate the differences because, let’s face it, this world is made up of varieties of human beings. We are not all the same! I’ve seen pictures of African people who look Chinese (“slanted” eyes, prominent cheekbones, thin lips), and Japanese people who look African (broad noses, not-so-straight hair). I’ve seen redheaded White people who look Black— despite their often pale complexion, their red hair is often curly or even bushy. And some of them (like Simply Red) sing “Black!” I’ve seen natives of India who are more ebony hued than some Africans. The Australian Aborigines and some Hawaiians (photographed in the late 1800s) have broader noses and fuller lips than many Africans do (and yet, they are not “classified” as Black because their hair is straighter; i.e., more “Caucasian” looking). The issue is not that we are different. It is only when we seek to judge each other and to place more value on one culture—or color—than another that we begin to have problems. How is it that Egypt is considered a “Middle Eastern” country, when it is in fact on the continent of Africa? The bottom line is that we are all human—red and yellow, black, brown, and white. And we all have equal value as human beings. Mam, where did you find this picture? Is it from a book, a journal? Where is it from? Unfortunately, I was not able to find the source of the picture. That’s one of the problems with relying on online sources. Thank you so much for reading my article. Try the book Six Black Presidents. Try the book Six Black Presidents. Another person, not a president but definitely a founding father, is Alexander Hamilton. This is the most info I have gotten anywhere on the 34th President of America. It is well needed. Thanks for your link. Unfortunately, it is no longer active. If you can find another legitimate site, please let me know, and I will be happy to post it. Yes this is true Clark Gables was a black man. So was Jackie Kennedy black lady… Please know the list doesn’t stop there. I attended an FHA conference when I was in high school and one of the speakers said something that has stayed with me the rest of my life. He said that there are not black, white, red, or yellow people. We are all different shades of brown. My dad taught me that each individual stands on their own merit regardless of the color of their skin. We are all part of the human family. The recent availability of genetic testing has actually shown that people are not always what they think they are. Loved your post, blessings! Mulatto is a slave term. Mixed is for animals. We are proudly bi-racial. Quadroon, octoroon, preto, trigueño, blanco oscura, Creole, light-skinned, etc., are all terms for Negroes descended from Black Africans. You might also want to use mestizo. Thank you for this article. I’d like to read more of what you write. How to subscribe? Colorism within the black community is understandable as reflecting and internalizing white prejudices and racist pressures. However, I think it is as important for individuals identifying (or identified) as black to look in the mirror of their heart and wrestle with the injustice of harboring such prejudices as it is for whites to look at and confront their own prejudices, racism, and responsibility for change. It’s hard, but it’s the right thing to do. Do you (just) want your kids to be happy, or do you want them to do what makes them better people and find happiness in doing so? What you want for them, strive for yourself. J Edgar Hoover, as a matter of fact, there is a video on youtube! The black woman who does the research for her family some 60 years later! Her family in the South were afraid to talk about it, because of fear for their lives! I loved this article….I have no doubt that there is far more African in white families than we know. It is all good. Every black person knows that Joseph Cotton was black – you can see it in his hair the curly waves at the front just wont let him quite pass. Regardless he was a great actor. Another famous person who has black origins is Charlie Chaplin – if you see pictures of his mother you will see the connection. Oh by the way I always thought Jimmy Carter and his wife had some of the juice as well. Also if you look far enough in the history of the British Royal Family you will also see they have Moorish blood in the blood line of Queen Mary. So we are all mixed – might as well just accept it. One should not be characterized by the way he or she looks on the outside or what by what blood they have. We are merely humans, on this earth but for a while. God does NOT judge by what you look like on outside, He judges you by your heart. Be kind to everyone. It would had been appropriate if you had credited the source for this article as Nile Valley Contributions to Civlization. Thank you for this additional information. As I mentioned in the article and previous comments, I had to rely on the sources available to me at the time this article was written.